The rink is almost ready! On-ice practices start this Wednesday!! We've had our initial team meeting but if you are interested in joining the team, it's never too late! Email club-hockey-officers [at] mit [dot] edu if you are at all interested in playing. There should be no hurdles (i.e. we will even loan you equipment!) to playing so just bring your willingness and enthusiam. Game schedule will be updated soon! Will add details once registration for them is set up! Come learn about the MIT Women's Club Ice Hockey Team this Monday, 9/19 at 7pm. We will meet in 1-132. No hockey or skating experience necessary! Hope to see you Monday at 7! In other news, MIT just won the Darcy Tournament D-division this past weekend! A subset of our team went to the North Shore for the weekend for hockey and beach time. Check out our winning team photo here!. Calling all women's hockey alum! Varsity, club, players, coaches! RVSP here. 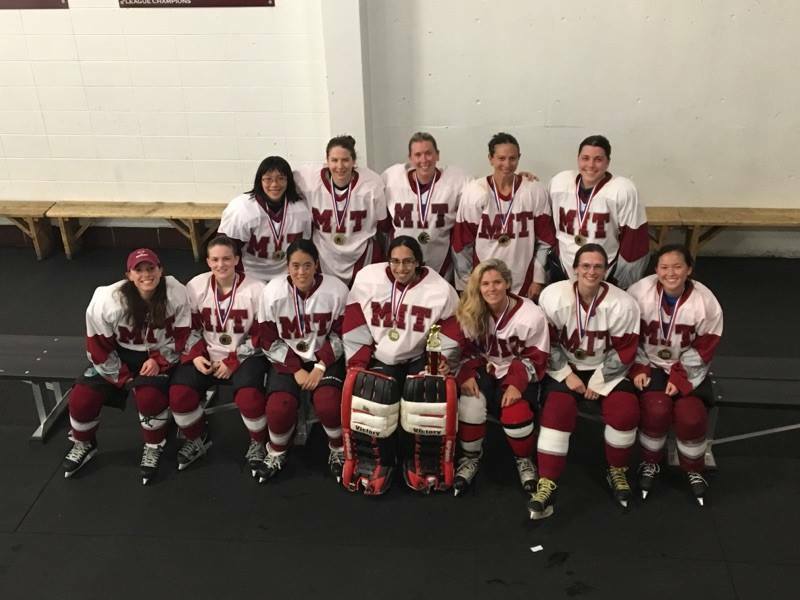 Come learn about the MIT Women's Club Ice Hockey Team this Thursday, 9/17 at 7pm. We will meet in the Johnson Ice Rink. We will first go over some club information; afterwards, anybody is welcome to stay for a short off-ice practice followed by a FREE dinner at Anna's Taqueria. Hope to see you Thursday at 7! Want to learn to play hockey? Miss the ice, miss the competitive edge? Join the team! We take players of all skill levels. Experience is welcome but not necessary. We will be recruiting during orientation and having a kickoff meeting and info session for new players in September. Email club-hockey-officers [at] mit [dot] edu if you are at all interested in playing. There should be no hurdles (i.e. we will even loan you equipment!) to playing so just bring your willingness and enthusiam. These are open to all! For more information visit our Skills Clinic page and sign-up! Come cheer on the MIT women's hockey team as they battle it out with U Mass Lowell to even the score. Start your Saturday night at 4pm at the MIT Johnson Ice Rink. Bring your pots and pans and your boisterous cheers! Tell your friends and bring them along by joining our facebook event. For more information visit our Skills Clinic page under Hockey 101. Please save Sunday Sept. 29, 6:30pm in 1-150 for our team meeting. This is a very important meeting in which we will explain how this season is going to be different for our team this year, and our coach Reggie will also go over plans for the season. Please plan on attending as we have quite a lot of information to pass onto you all, and you will also get to meet new and old members of the team! As an added incentive, we will provide you all with dinner. Starting today Thursday September 12, coach-led dryland practices will be 7-9pm on Mondays and Thursdays. Meet in the Johnson ice rink. Wear workout clothes and bring a water bottle. If you need to borrow a stick and gloves please come 15 minutes early. Want to learn to play hockey? Miss the ice, miss the competitive edge? Join the team! We take players of all skill levels. Experience is welcome but none necessary. We have a kickoff meeting for new players so come and learn about the team and eat some free dinner! RSVP by email or on facebook. Next year social media will be a big part of communication for the team so tell your parents, tell the alums, tell your friends: to join the fan email list and like us on facebook. We'd like to show our appreciation for our alumnae the best way we know how - on the ice! You are cordially invited to come join us for fun and excitement on the ice with the current team as a big thank you. So save the date for you and your family and dig out all that hockey gear! There will be snacks for hungry skaters, and we'd love to tell you the recent team news over a mug of hot chocolate. We'll also be selling team t-shirts and classic team jerseys at the game, so bring your checkbook if you would like a piece of team history to take home. We will have a limited amount of gear and skates available for use, but do try to bring your own. You can find information about parking at MIT here. Please RSVP to Cristi Wilcox (cwilcox@alum.mit.edu) if you're interested in coming. We'd love to hear from you whether or not you can come. Lastly, please help us by spreading the word to former teammates both near and far, as our alumnae list is not comprehensive. The more, the merrier! Both clinics will be instructed by our head coach Reggie Herbert, who is also the on-ice director of Pro Ambitions Hockey. To pre-register please fill out the preregistration form. The cost is $20 per clinic or pre-register for both clinics or pre-register with a friend and pay $30 for two. Players must have membership or a day pass to get access to the Johnson Ice Rink on campus. Arrive early to be ready to hit the ice at 7pm. Full equipment is mandatory for all participants. There is limited equipment to borrow, with pre-registration, but players must have their own skates. Alums, we have already scheduled the alumnae game so mark your calendars, track us through the season, and get excited to celebrate the end of the season with us. Hope to see you there! Our first official meeting of the season! Coaches and captains will discuss the upcoming season, including expectations and the prospective schedule. We will also go over the results of the post-season survey from the spring. All players, new and old, are expected to attend. We'll see you there! Graciously hosted by one of our goalies Quinn McGough, this is a laid back chalk talk covering hockey basics like rules, terminology, what a typical practice is like, what a typical game is like, how to put on your gear, etc. It's for anyone who wants to learn or get a refresher. Following that excitement we'll watch some hockey starting around 8:30pm which will feature some movie style popcorn. Meet in the Z Center lobby and bring your sticks and gloves if you have them. If you don't have any, meet at 8:15pm outside the rink.